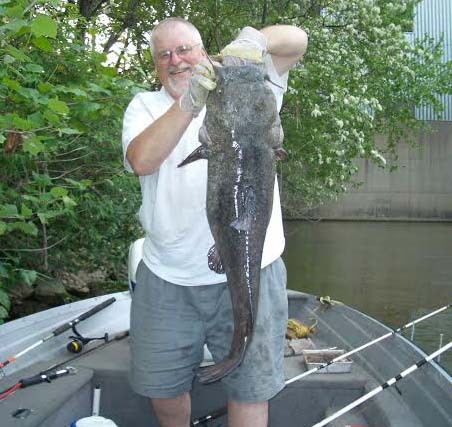 Cover picture – Russ Cook holding a good sized Ohio River Catfish that he caught. The problem with the world today is that not enough people spend time fishing. 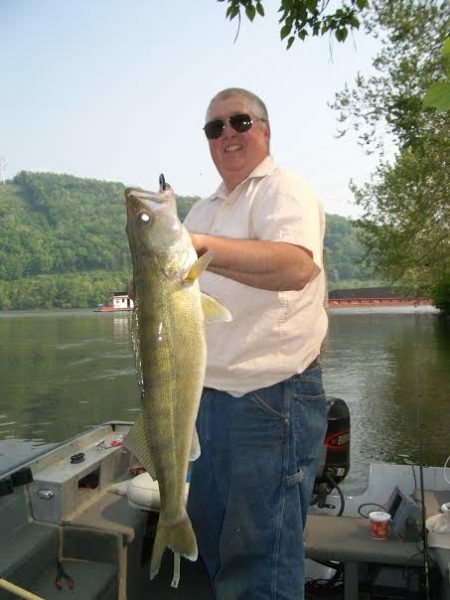 Fishing the Ohio River is one of the great traditions here in the West Virginia panhandle. The cleanup efforts during the latter parts of the last century resulted in an impressive resurgence of aquatic life in the river making it one of the premiere sport fisheries in the state. This document will discuss how we go about fishing for catfish in the Ohio River. If you are not a fisherman or fisherwoman, read it anyway and remember that it is virtually impossible to stress out about other things while you are fishing! Before we talk about Ohio River catfish fishing, I need to provide a little personal background. If you read any of the issues of Betty’s Garden Diary, you already know that I grew up on a small farm in central Ohio. My first memories of fishing involve holding a cane pole equipped with a hook, sinker, and bobber fishing for bluegills in the pond at my aunt and uncle’s farm using earthworms as bait. As I got older, that expanded into fishing for other species in other waters, but I never fished in a river until we moved to West Liberty just over forty years ago. The first year or so after we moved here, I would fish for crappies, bluegills, and trout at Castleman Run lake or Bear Rock lake. One day, I visited the fishing pier at Pike Island Dam on the Ohio side of the river. There were several older retired guys there and they were pulling out walleyes, sauger, carp, catfish, stripers, gar, sheephead, and other species and almost all of the fish they were catching were much larger than what I was catching at Castleman Run Lake, so I started fishing at the pier. For most of that first summer, I didn’t catch too much, but, I gradually got to know the regulars who fished there and they began to show me what they were doing. A guy named Willy always fished for walleyes and sauger using a jigging spoon which I had never used before. Another guy always fished for carp using homemade doughballs. Several of the regulars would cast two ounce lead spoons out to the floodgate to catch the hybrid striped bass. A couple of guys sometimes came out at dusk and fished for the big catfish using cut up pieces of bluegills or shad for bait. By the second summer, I had become one of the regulars at the pier and those guys had accepted me into their group. They shared some of their fishing secrets with me. After a few years, I was able to obtain a 16 foot fishing boat, so I no longer visited the pier very often. However, I still used what I learned from the guys at the pier when I fished in the river. During the almost 40 years since those guys taught me how to fish in the river, I have learned some things from personal experience. The purpose of this document is to share with you some of the catfish fishing tricks that we have learned over the years. 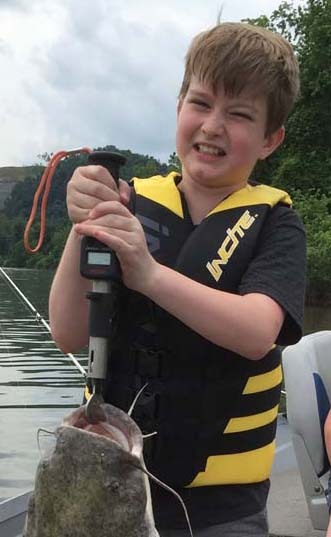 In the section of the Ohio River that borders the Northern Panhandle of West Virginia, the two most common species of catfish are channel catfish and flathead catfish (AKA shovelhead catfish). Flathead catfish can grow much larger than channel catfish. The WV state record flathead catfish weighed 70 pounds and the state record channel catfish weighed 33 pounds. Farther south, the river hosts a population of blue catfish which look very similar to the channel catfish, but can grow to be much larger. Both blue catfish and flathead catfish have been known to grow to 100 pounds or more. We have never caught a blue catfish in the part of the river that borders the Northern Panhandle. Our largest channel catfish weighed 19 pounds and our two largest flathead catfish each weighed 35 pounds. 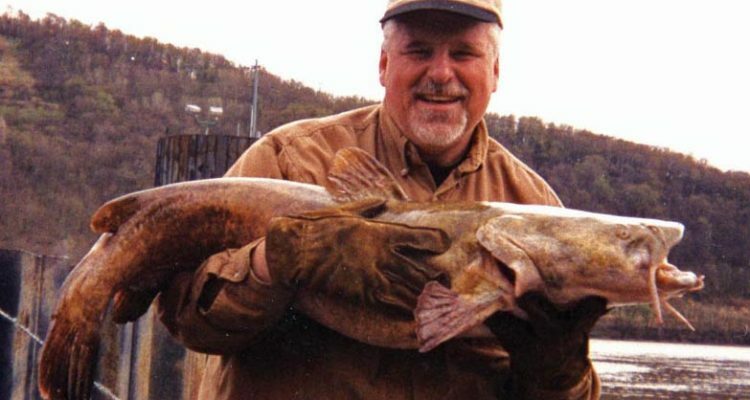 If you are planning to go after the big catfish for the first time, the things to consider are timing, technique, location, and tackle. 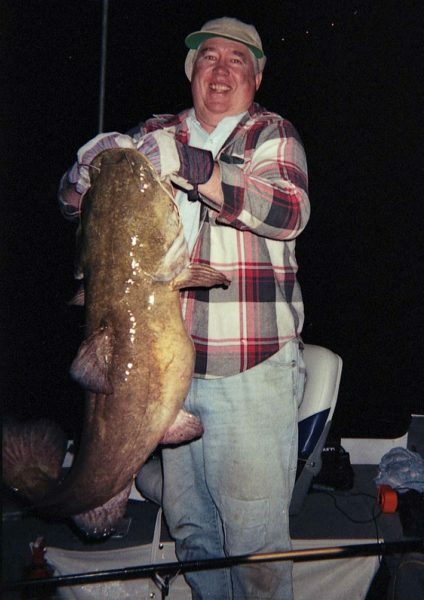 Russ Cook caught this 35 pound flathead catfish. 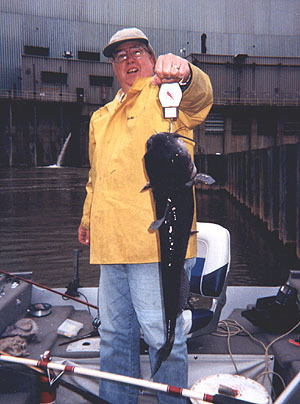 Timing: Timing is easy to discuss because the flathead and channel catfish are the most active in the spring when the water begins to warm to around sixty degrees and as it continues to warm to the spawning temperature which is around seventy degrees. They are very actively feeding during the period just before they spawn, so the period from mid to late March to around the end of May provides your best chance to catch a monster catfish. 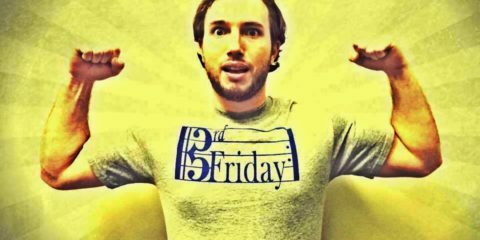 The time of day also impacts your catfish fishing success. When we go onto the river for catfish, we usually launch the boat an hour or more before dusk so that we can get to our fishing location and get the boat anchored before the catfish begin feeding. The catfish usually begin actively feeding just before dusk and continue until around midnight. On overcast or rainy days, the catfish often start feeding much earlier in the day, so we head out earlier in the evening on those days. Location: The Ohio River contains a lot of water and most of that water does not contain catfish, so choose your fishing locations wisely! Our favorite catfish fishing locations include the areas just downstream from the mouths of creeks. Usually there is a gravel bar where a stream enters the river. We anchor in about four or five feet of water on the gravel bar using two anchors to hold the boat positioned. We put the bow of the boat upstream and drop an anchor that digs into the sand. Then, we back the boat downstream and drop another anchor and pull the ropes tight so that the boat is held parallel to the river between the two anchors. The outflow from the creek provides lots of food for the catfish and for the bait fish that the catfish eat. Another of our favorite fishing locations is just downstream from a bend in the river. In those areas, the back current below the bend deposits silt creating a shallow shelf that contains lots of debris. The shelf sometimes extends a couple of hundred feet into the river before dropping off into 20 feet of water or more. The shelf often holds vegetation and hosts a population of shad and other bait fish. Around dusk, the catfish migrate up onto the shelf to feed. We usually anchor in 5-6 feet of water using our two anchor system to hold the boat parallel to the shore. Then, we cast our lines out to the drop-off. Another favorite fishing location is near the warm water outlet from a power plant or factory. If you are going to fish at a warm water outlet, be sure to respect the security guidelines of the power plant or factory and make sure that you stay clear of any equipment that the power plant or factory has working in the river. Another 35 pound Ohio River flathead catfish. Tackle: If you are going out to fish for 30 pound catfish, you need to have tackle that can handle fish that big. An ultralight crappie rod spooled with light weight line will not get the job done. However, you do not need expensive or fancy rods and reels either. My catfish rods and reels came from local department stores. My favorite catfish rods are eight and nine foot medium heavy action catfish rods which are white in color. I like the white color because it is easy to see at night with very little light. One of my older rods was black, so I sprayed about ten inches of the rod tip with white paint to make it visible at night. I have fitted my catfish rods with large open-face reels which are spooled with bright orange 30 pound test monofilament line which is also highly visible in low light. I have one ten-foot catfish rod which I use when I am bank fishing and need to make longer casts. The large open-face reel on that rod is filled with 20 pound test bright orange monofilament line which provides for longer casts compared to the 30 pound test line on my boat fishing rods. We tried using braided line on our catfish rods, but the zero stretch characteristic of that line caused us to lose two rods in the river when the catfish or carp grabbed the bait and took off! We also broke off more fish with the braided line and it is impossible to see in the dark. It is also a lot more expensive. Our fishing rig is very simple! Note the shape of the circle hook. We thread that main line coming from the reel through a two or three ounce no roll sinker and then tie it to a large swivel. I prefer swivels that have solid loops on them, but any large swivel will work. I do not usually use snap swivels because the snap tends to catch the line causing a weak spot where it breaks under the pressure of a big catfish. The flat “no roll” sinkers help to keep the line from drifting downriver. On the boat rods, which are loaded with 30 pound test line, I use 20 pound test monofilament or flourocarbon leaders that are about 14-16 inches long. Since main line on my bank fishing rod is only 20 pound test, I use 14 pound test leaders on that outfit. We always use monofilament or fluorocarbon leaders with a breaking strength well below that of the main line. In case of a snag or of a break-off by a fish, we only lose the 14-16 inch leader thereby reducing the hazard to the environment posed by old monofilament line in our waterways. The fluorocarbon or monofilament leaders are almost invisible in the water especially at night. On one end of the leader, I tie a perfection loop to make it easy to attach to the swivel. The other end is attached to an 8/0 circle hook using a hook snell knot. Both knots have knot strengths of 100% of the breaking strength of the line. The 8/0 circle hooks are about an inch in diameter. However, the average size of the Ohio River catfish that we catch during a typical evening is six to eight pounds, so that large hook works well. I like the circle hooks because they almost never gut hook a fish. If the fish swallows the circle hook, it simply pulls out. Although I like the circle hooks, all of my fishing partners still use size 7/0 or 8/0 J hooks. We never use stainless steel hooks because they will not decompose if they are broken off whereas the normal bronze coated carbon steel hooks will rust away in a couple of years if they are broken off on a snag or swallowed by a fish. The swivel between the main line from the reel and the leader provides a stop for the sinker. Often, the cut bait will spin in the water when the line is reeled in, so the swivel also prevents line twist on the main line. Technique: Our fishing technique is simple. We bait our hooks with fresh cut bait made from bluegills, skipjacks, or shad. Big catfish do not dine on chicken livers or hotdogs. They eat other fish, so that’s what we use for bait! Sometimes, we will use whole live bluegills for bait, but we have had more success by cutting them up. Frozen bluegills work, but not as well as fresh bluegills. 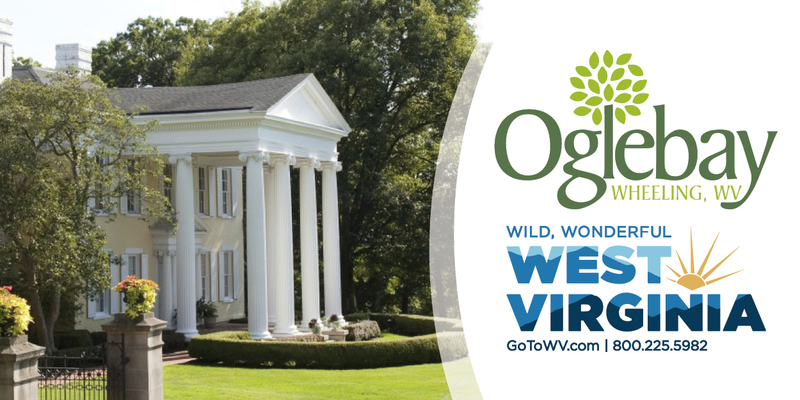 By the way, I called the folks at the WV Department of Natural Resources in Charleston and asked if I could legally use bluegills for catfish bait. They said that bluegills are legal to use as bait as long as they are caught legally using a rod and reel. When we bait our hooks, we are careful to leave as much as possible of the hook points exposed. Each of us usually fishes with two rods, so cast those out in a fan pattern to provide plenty of separation between the lines and to cover lots of water. I leave the bails on my reels closed after making sure that the drag on each reel is properly set. One of my usual fishing partners opens the bails on his reels and then closes them when he is ready to yank on the rod to set the hook. 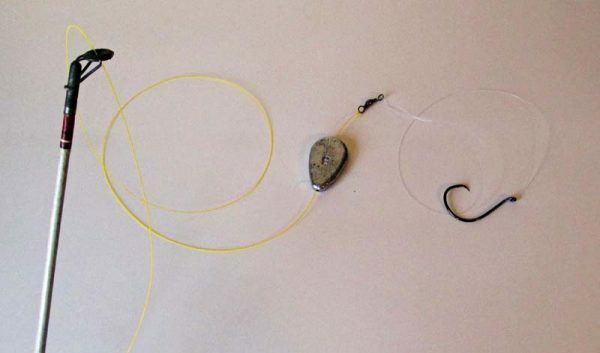 With a circle hook, there is no need to yank on the rod to set the hook. When the catfish swims away with the bait, the line slips out through the corner of the mouth and circle hook catches the corner of the mouth automatically. Jerking hard on the line usually causes the circle hook to pop out of the mouth of the fish instead of catching the corner of the mouth. When the rod bends down, you just pick it up and the fight is on. I always secure my rods with lanyards made of heavy cord so that the fish can’t pull them into the river. We use a very large landing net with a beefy frame to boat the fish. If the fish is large, we lift the net by grabbing the hoop and some of the net instead of the handle because the handle would collapse under the weight. Earlier, I mentioned that we were fishing under very low light conditions. When our boat is anchored, we display only the white stern light as required by the West Virginia and USCG Boating Regulations. Most of the time that is our only source of light. Even though it is not a lot of light, the white rods and orange lines are easily visible. When we need more light to bait a hook, unhook a fish or work on tackle, we use flashlights or clip-on LED work lights. Catfish are nocturnal feeders, so they will avoid the area if you light up a propane lantern or other source of bright light. In addition, a Coleman lantern is a magnet for insects. We learned that lesson the hard way! If you are shore fishing, turn your lantern down low and set it on the ground several feet away from where you are situated to keep the bugs away and so that it does not illuminate much of the water where you are fishing. This five pound walleye bit on a catfish line. The fish looks larger because it is being held toward the camera using a 30 inch long fish grabber! When you go catfish fishing on the Ohio River, you never know what you will or will not catch. You might hook a two pound catfish or a 50 pound catfish or a leatherback turtle or a gar or something else. On one trip, I caught the five pound walleye in the picture above on a piece of cut bait. One summer, my boat partner caught an eel about 30 inches long on the West Virginia side just north of Beech Bottom Marina! 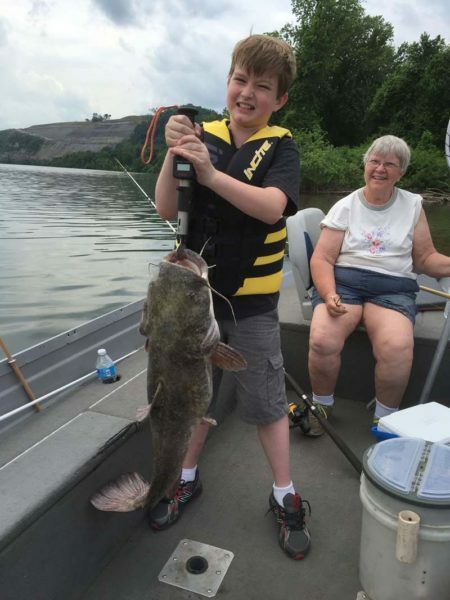 Last summer, our ten year-old grandson caught the 18 pound flathead catfish shown earlier in this story. There have also been plenty of evenings when we didn’t get a single bite. Our largest two catfish so far weighed 35 pounds, but we have caught a lot that weighed between 10 and 20 pounds and have caught a number that weighed between 20 and 35 pounds. On a typical evening, most of the catfish that we catch weigh 6 to 8 pounds and we often catch one or two that are over 10 pounds. We take pictures of the larger fish and then return everything that we catch to the water. 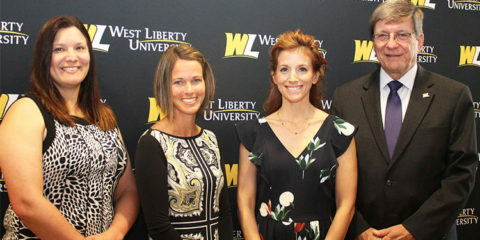 We do not participate in the WV Trophy Fish Citation Program. However, you may want to do so, especially if a qualifying fish is caught by a child. You may document the eligibility of the fish for a citation by taking a clear photograph that shows the length of the fish, so be sure to take along a tape measure that has large enough numbers to be read in a photograph. The minimum qualifying size for a channel catfish is 6 pounds or 25 inches. Channel catfish that size are fairly common when fishing the Ohio River. Flathead catfish need to either weigh 10 pounds or be 29 inches long and those are also somewhat common in this part of the Ohio. Please qualify your catfish by documenting the length of them using photographs so that you can release them back into the river unharmed. Invest in the proper tackle. Most people are not going to land a 15 or 20 pound catfish on a lightweight rod and reel spooled with lightweight line. If you use tackle that is too light, you will break off a lot of fish and pollute the river with monofilament line. I do not own any expensive fancy brand name rods or reels. Just visit the local department store or outdoor store and you will be able to find what you need. Also, be sure to have a huge landing net with a very beefy frame. You are not going to boat a 25 or 30 pound catfish with a wimpy landing net. Stay safe on the river! If you are going to fish from a boat, be sure that you are in a boat that is big enough to handle the wake from a barge or a poorly trimmed speedboat going by. Do not overload the boat and be sure that you have all of the prescribed safety equipment readily available. 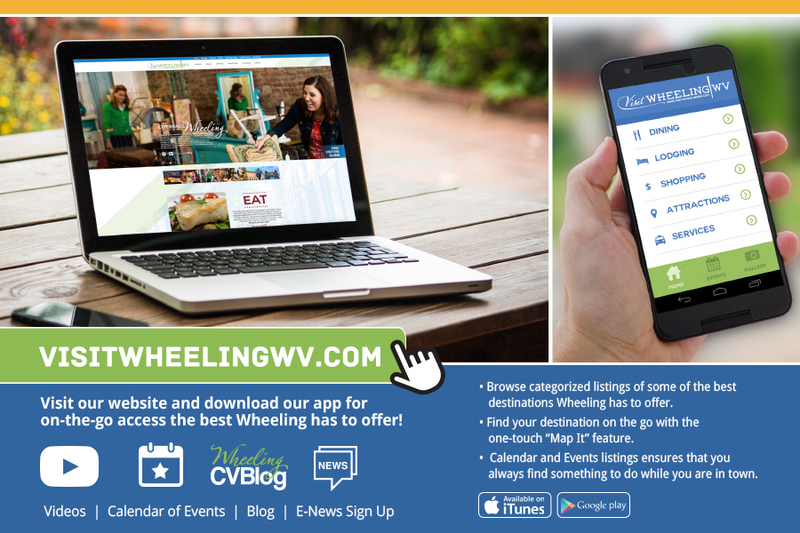 To download the official guide to the West Virginia boating rules and laws, click this link. 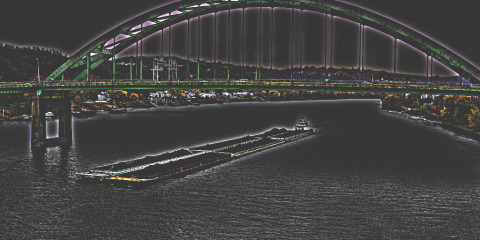 Since you will be on the river after dark, make sure that you have the proper navigation lights and that they work. Be sure to have a couple of good waterproof flashlights with fresh batteries with you. Take a cell phone with you, but be sure you have a Ziploc bag or other waterproof container for the phone in case you get caught in the rain. Take along a jacket. 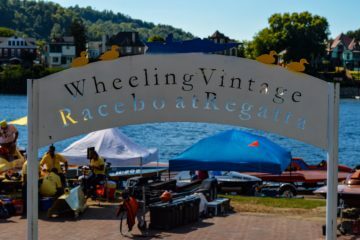 The temperature may be 75 degrees when you head out at 6:00 pm, but it could be below 60 degrees when you are driving down the river to the dock in the middle of the night! I always take a rain jacket. It blocks the cold wind on the way back to the dock and it comes in handy when we get caught in the rain! I put my rain jacket into a large ziplock bag to keep it dry until I need it. If you like to wear shorts, be sure to take along a pair of long pants! Be especially thoughtful about this if any children are in the boat. Remember that any child in the boat must be wearing a proper PFD at all times. Leave the alcohol at home. 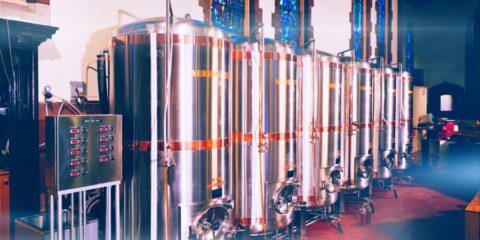 Most boating accidents involve the use of alcohol. Notice that Heath was wearing a properly fitting life jacket when this picture was taken. It was a good Coast Guard approved design which was comfortable to wear and had closures that would keep it from coming off in case he went into the water. This model also has a full back which provides a lot of Hypothermia protection. Heath is also a good swimmer. 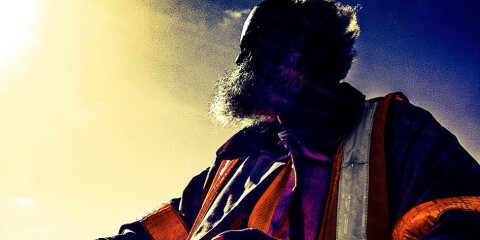 Respect the river. When the river is at normal levels, the current only amounts to half a mile per hour or so. If the wind is calm, it is almost like boating on a lake. If the wind is blowing enough to create whitecaps, the river may look calm, but the waves might vary three feet from trough to crest which makes it very choppy for a small boat. We don’t go out onto the river if there are visible whitecaps. Add the wake from barge to that and it becomes very dangerous. We fished on the river one time when it was six feet above the normal level. The current was at least twice the normal speed and there were strong whirlpools and back currents. 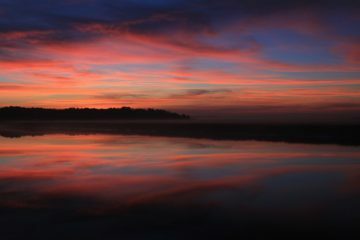 In addition, whole trees and other debris floated by creating dangerous boating hazards, so we could not fish after dark. Respect the barges. They are surprisingly difficult to see at night because their front navigation lights are located on the outer corners of the tow, so they blend in with the lights on shore. Except for crossing the river, we always stay to the side of the barge channel when we are traveling on the river after dark. If you are taking children to fish from the shore, choose a location where the water next to the bank is not deep. If it is deep, then the children need to wear life vests. For example, the water next to the public docks at the boat ramp on 12th street in Wellsburg is almost 20 feet deep. Watch the weather. Getting caught in a thunderstorm on the river at night in a fishing boat is extremely dangerous. Make sure that you have a good weather app on your phone. I use WeatherBug. Pay attention to the forecast before you go to the river. If scattered thunderstorms are forecast, check the weather app every hour or so and look at the radar image. If thunderstorms are headed your way, get off of the river quickly because those storms can move in very fast. In addition to the hazard from the lightening, the winds from a thunderstorm often quickly create large dangerous waves which can swamp a small boat. Respect the environment. Avoid discarding trash in the river. We carry a container with us for trash so that we can dispose of it properly when we get home. Above all, NEVER throw old monofilament fishing line into any body of water. It creates a dangerous hazard for wildlife which become entangled in it and die. Old fishing line also poses a danger to boaters because it can wind up on the propeller shaft of an outboard motor and compromise the oil seal behind the propeller causing the oil in the leg of the motor to leak out into the river thereby polluting the river and causing premature failure of the bearings, etc. in the lower unit because of the lack of lubrication. Regardless if you are fishing from a boat or from the shore, spending a quiet evening at the river fishing for catfish is a great way to unwind and leave behind the stresses of the day. It is an inexpensive hobby. Other than a few bluegills for bait, all you really need is a rod and reel full of line along with some hooks and sinkers and a good landing net. If you have never fished for Ohio River catfish before, just follow the instructions in this document and you are sure to be successful. Have fun! When we fished the river our line was a string, a bolt and hook was tied to the end of the string. We twirled the bolt a few time and let if go. If we forgot to step on the other end of the line we quit fishing and went swimming. the only thing we caught were cat fish and carp. At the end of some creeks I have heard of people catching blue gill but I never saw them or caught them.